Bend Chamber invites you to kick-off the New Year with their first What’s Brewing of 2019. Minors in the Supers is a legislative look forward with Representatives-Elect Cheri Helt and Jack Zika and Senator Tim Knopp. This is an opportunity to sit down and talk about the issues before they begin their frequent travels back and forth to Salem from January through June. The evening will be moderated by Katy Brooks, Bend Chamber CEO, with questions from the audience, and cover the issues we anticipate seeing, what our elected officials are pushing forward and their strategy for overcoming the hurdle of being a minor party in a super majority legislature. “I decided to run for State Representative to bring a stronger voice to Salem for our children. I am excited to share with you the things we’re already working on in collaboration with local, regional, and state leaders and through bi-partisan partnerships. Childcare, Court-appointed special advocate (CASA), foster kids, fully funding education and more. I’ll be an inclusive, independent voice for Bend. I’ll listen and advance pragmatic ideas but need your help. Please bring good questions, thoughtful comments and big ideas. Challenge us, your Central Oregon delegation, even though we are freshman legislators and in the minority party. Together, we can make things happen for our community and our state!” Representative-Elect Helt has been assigned to the Student Success, Education, Human Services and Housing committees. “I look forward to working with our new State Representatives-Elect in a legislative session of great importance and opportunity. No matter the many challenges we will face, we must make our voices for Central Oregon heard. While serving in the Oregon House from 1999 – 2005 and as State Senator since 2012, I have always felt strongly about constituent engagement and believe hearing from people who work and live in Central Oregon is the best way to guide my decisions. 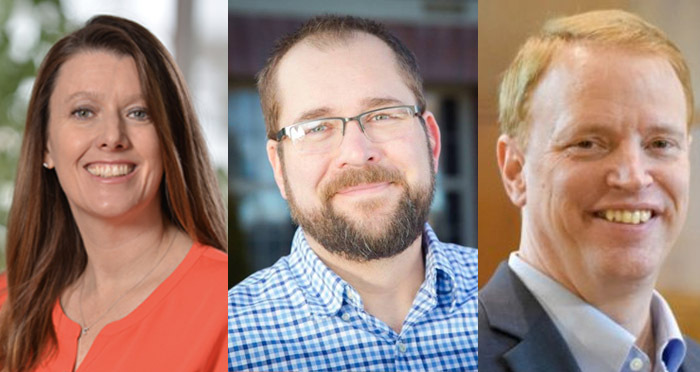 Please speak up during Bend Chamber’s forum, and write, call, or email my office anytime.” Senator Knopp has been assigned to Housing, Campaign Finance, Capitol Conduct, Conduct, Workforce, Human Services, Health Care and Student Success committees. Registration includes a tasty beverage and appetizers. Registration is $5 more at the door. There is additional parking north of the Pub building, as well as across the street, and along the shoulders of 18th St., but make sure you leave enough room near driveways for large truck deliveries. Do not park in “No Parking” or “Loading Dock” areas as your vehicle will be towed without prior warning.